After being lucky enough to win tickets to this year's Baby Show, we spent a small fortune getting to, and purchasing goodies whilst there. I was unprepared for quite how big London ExCel would be, and was surprised to find that the Baby Show was one of four major exhibits going on at the same time. Tots Bots. Only just inside the door, and the shopping had begun. We were greeted by the lovely Fiona, and proceeded to purchase among other things the beautiful new London easyfit. They are only available for pre-order so I am eagerly anticipating some fluffy post in the near future. The London easyfuit by Tots Bots with poppers. We found more bargains over at Me & I with some lovely clothes for Dylan which should fit perfectly over his cloth bum. I especially love the trousers with a little duck poking out of the pocket. We picked up some excellent products for cheap prices all over the place, and collected our fair share of freebies. The Mum-Mum organic rice biscuits are dissappearing fast! We entered Dylan into the 'Face of 2013 Baby Show' competition, which was sadly the only part of the day that his cheeky smile was missing. We entered the fantastic competitions from Britax, Mamas and Papas, Fisher-Price and many others. We tried out the lovely baby changing facilities completet with complimentary nappies (for those that use disposables) and the Tommee Tippee feeding area with divine nursing chairs. 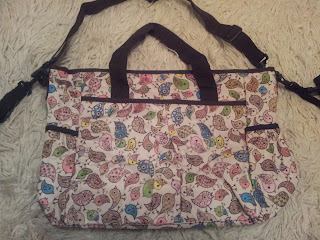 I treated myself to a new changing bag, as the superficial me is getting rather bored of the lovely Miracle Bag I have sported for the last six months. Momymoo sold me a beautiful new one for only £30! All in all we were very impressed with the show. I was initially worried that it would be more relevant to those expecting a baby, but it was interesting, informative and full of shopping opportunities for those already with children. We will definitely be visiting again next year! Dylan was perfectly behaved all day, content to watch from the comfort of his buggy or the sling. It is well worth a visit. We want to go again next year! Hopefully you will be able to go then?